Wing Wednesdays is what you want if you’re looking to celebrate making if halfway through the week, then you’ll want to come down to Blackjacks roadhouse & Games Room. Our 2 for 1 deal is to die for, and you can wash it all down with a $4 pint of Original 16 Copper or Pale. Why? Becasue we’ve got the BEST WINGS IN TOWN! Come try our house breaded wings. You can have them crispy delicious, or saucy and satisfying! Try our home made Jack Daniels BBQ wings, or our very own Drunken Hot Wings. You can even ask for the non-menu Honey Hot. We don’t stop at the wings though, because we also have $4 pints of Original 16 Copper or Pale. 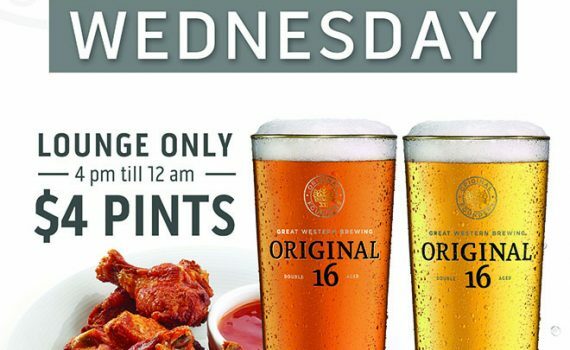 Every Weds night from 4pm to Midnight we have great wings and wreat beer for a great deal. Lounge side only.